If you are keeping up, or trying to keep up with all of the happenings on I-Drive in Orlando (International Drive), you’ll want to sign up for updates on a new web site. 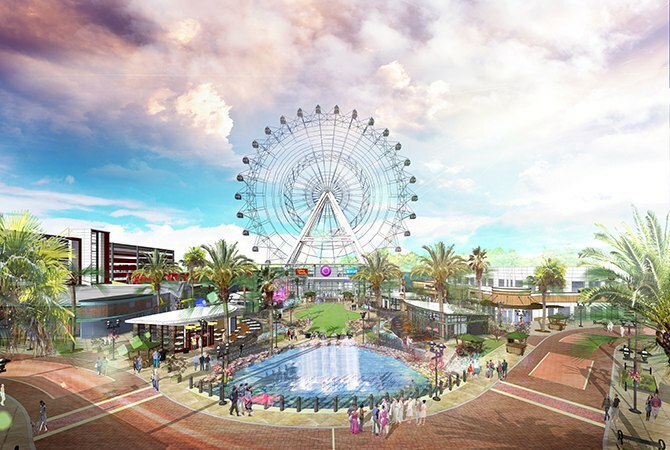 The Orlando Eye’s official site is live and registers people who want to receive updates concerning this new attraction in Orlando. The site, officialorlandoeye.com offers everything you need to know about this Orlando attraction. ORLANDO TOURIST TIP: Their Facebook page is another way to keep up with the latest updates. New restaurants continue to open in the I-Drive 360 entertainment area where the Orlando Eye is located. Carrabba’s Italian Grill and Outback Steakhouse were the first to open and offer a great atmosphere. Carrabba’s is huge with 7,800 square feet. The dining room offers family tables and an open kitchen. The bar is modern and mixes traditional and contemporary design inspired by an Italian decor. Outback Steakhouse will also step it up with a “modern Australia” design both inside and out. If you are planning a visit to Orlando, be sure to check out the I-Drive area. There is a lot to do here and more being planned. Another attraction in the works for this entertainment complex is SKYPLEX. Claiming that it will be the world’s tallest roller coaster, The Skyscraper™. It is named that, because it takes up very little space on the ground, but is 570 feet tall! Next to it is the Orlando Eye – a 400-foot tall observation wheel which opened in the first half of 2015. The huge observation wheel provides a view you’ll want to keep your eye on and not miss out. The Seven Dwarfs Mine Train has opened (May 28, 2014) in the Magic Kingdom park. This was one of the final pieces of an extensive puzzle to be put into place within the New Fantasyland at Walt Disney World Orlando. This Orlando attraction is the centerpiece of Disney’s newest addition and offers an inspiring view when you reach the top of the mountain. It also offers much more. The ride itself is unique in many ways. It is the first-of-its-kind coaster system that allows each cart to swing and sway individually. The specially-designed mine cars are created to look like the train in the film – hand-made of wood by the Dwarfs, shaped by an axe, built to haul jewels and rocks from the mine. As with most Disney creations, every detail has been accounted for. Each train is made with 5 cars which hold 4 guests each. With a height requirement of just 38 inches, this new attraction welcomes younger guests who want to ride a grown-up roller coaster, but need to keep it somewhat calmer (no loops). The ride experience is somewhat different when in the front than the back. The total length of time on the ride is around 2 minutes, but there are plenty of fun things to do while you are waiting in line. You may want to experience this ride over and over again! The theme park’s Imagineers have out-done themselves on this new ride attraction. While in the mine, you’ll be tempted to focus on all the jewels, but be sure to check out the animated figures, particularly the faces. They are amazing. 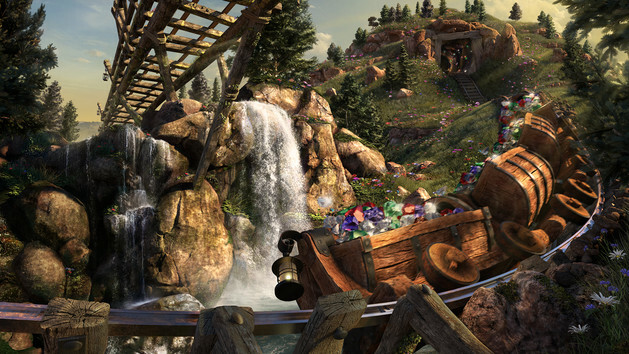 All of your favorite characters are included in the Mine Train attraction – the seven dwarfs… can you name them all? Snow White is there, of course, and the Wicked Queen. Your favorite music scores are included too. As you round the curve in the mine, “Heigh Ho, Heigh Ho” will take you up another hill as the dwarfs head home to a rustic cottage. ORLANDO TOURIST TIP: Watch the film before your trip to Disney if experiencing this new attraction is on the top of your list. You’ll be amazed at the detail to which the ride copies the film. Be sure to schedule this ride as one of your FastPass+ options if you have younger children (over 38 inches tall). Although you’ll have to wait in line to experience this new ride at Disney, don’t be Grumpy – the wait is sure to be worth it. Until then, the Bashful can get a hint of what the ride will be like by watching the video below which Disney released prior to its opening. You won’t be Sleepy during this ride! A trip to Disney will make you Happy, and if not, you need to see the Doc! People often think of Florida as being home to Mickey Mouse (at the Walt Disney World Resort), Universal Studios, SeaWorld, and a whole host of other man-made, fun attractions. It is home to all of these things, but there are also plenty of natural and environmentally friendly things you can do in Florida too. 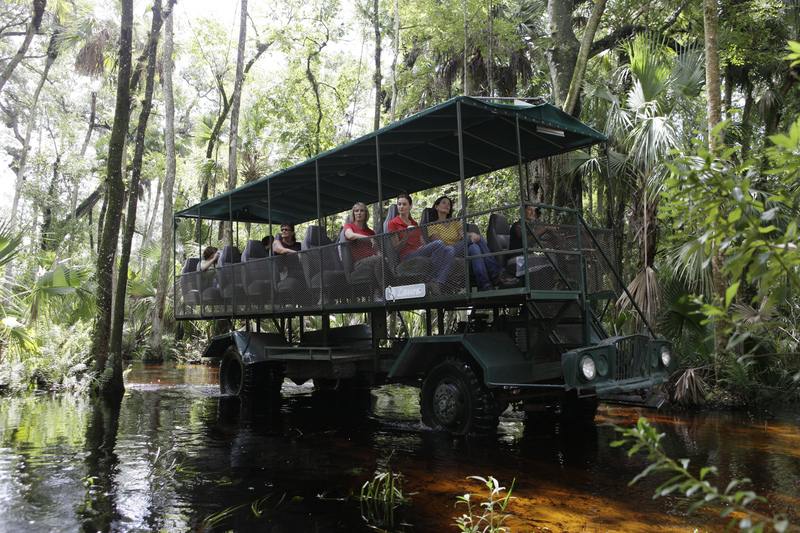 One of these is often ranked as one of Florida’s top attractions: an Eco Safari through the incredible natural wild of Florida’s native environment and the chance to see it’s wildlife in designated conservation areas. So What Exactly Is An Eco Safari? An eco safari is a natural adventure that the whole family will enjoy, and a fantastic way to spend a day of your Florida vacation. You will board an open air safari coach and head into a natural Floridian conservation area, where you will learn about the distinct eco systems that Florida enjoys. Just like on an African safari, you will also be able to spot all of the local wildlife as you travel: in Florida this means the chance to spot black bears, alligators, white-tail deer, around 200 types of birds and, if you’re really lucky, you may even see the famous Florida panther. Your safari will be lead by a local expert, full of knowledge and keen to share everything they know about natural Florida with you. If you have an interest in conservation and like to lead as green a lifestyle as possible then an eco safari is one Florida attraction that really shouldn’t be missed! How Green Is a Vacation To Florida? Florida isn’t really thought of as a ‘green’ vacation spot, but like any vacation destination, a trip to Florida can be as green or as environmentally damaging as you choose to make it: and much of this will depend what you decide to do whilst you’re on your vacation. There are many restaurants serving locally sourced foods, so you can reduce your food miles, and enjoying activities such as an eco safari is carbon offset fun too. The main environmental impact you will cause on your Florida vacation is actually traveling to reach your destination! Of course, the negative environmental impact of flying is well-documented. But if you have environmental concerns there are other, slightly more environmentally friendly ways of traveling. You could travel in luxury and choose to cruise to Florida rather than fly, for example. According to Iglu Cruise, modern ships are now being designed with the environment in mind. Many ship companies are now painting the hull with a silicon based paint so the ships glide through water more easily, therefore saving fuel, and “Royal Caribbean Cruises have taken this a step further by designing aerodynamic hulls, increasing the benefit of this fuel saving tactic.” If cruising to Florida simply isn’t a feasible option for you, but you still wish to travel in as environmentally sound a way as possible, why not consider offsetting the environmental impact of your flight or drive to your vacation destination? ORLANDO TOURIST TIP: You can use a carbon calculator to work out the amount of carbon emissions your flight will generate, and then work out what you have to do to offset that: for example, by planting new trees, cutting back on the amount of other travel you undertake or funding a waste conservation program of some kind. There are even specialist carbon offsetting companies that will do the hard work of this for you. Like the sound of an eco safari and want to experience the more environmentally friendly face of Florida? There are plenty of companies in Florida that offer this incredible experience. And you’ll be surprised to learn that many of them are in the heart of Orlando! Here is a list of recommended suppliers. Why not book your fantastic tour for the whole family today? Forever Florida offer eco safaris on both open sided coaches and also eco safaris on horse back! These incredible experiences last around two hours, followed by a visit to the centers Visitor Center, where you could enjoy a tasty home cooked meal or shop for the perfect Florida-themed gift. For more information visit their website. EverGlades Day Safari incorporates a boat cruise into their eco safari offering (the perfect chance to spot an alligator or two) and they even offer specific child-friendly tours for their younger guests. For more information visit their website. Article written for Orlando Tourist Tips by Claire Foster, December 2013. Titanic: The Experience should be at the top of everyone’s Orlando attraction planning. This attraction is located on International Drive, near the many popular theme parks and water parks tourists flock to visit. The fascinating difference, while nestled between an Indian Restaurant and a Chinese Buffet, is that it really isn’t in the “attraction” category. This amazing Orlando attraction actually allows guests to become part of the one-hundred year old history. The artifacts on display in this museum are from the actual ship that sank; recovery of said artifacts became available with new technology. Although the Orlando attraction Titanic: The Experience is a museum, it is surprising to have a “tour guide” meet you at the front entrance. Even though you would not think so, this creates a memorable visit for everyone. The tour guides are former “passengers” on the Titanic. Starting from the history of building the magnificent ship to its final resting place at the bottom of the ocean, the guide explains the museum artifacts as they had actually lived them. The uniqueness of having a new tour guide with each visit adds to the thrill; seeing a new version of how they “lived” through the sinking and each artifact through their words. ORLANDO TOURIST TIP: Do not fret if you miss exploring artifacts at length. At the end of each guided tour guests are left to slowly go back through the museum and take their time learning about each item on display at their own pace. The tour of this Orlando attraction starts by a recreation of one of the Titanic’s giant propellers. Being able to stand beside one of the massive propellers will give you a sense of how enormous the ship actually was. The guide will lead you on a journey, making you feel like you are actually there. Stopping to see the radio room, where operators tried to call for help, can bring a feeling of sadness over you. To know the earlier rudeness by operators, to nearby ships, caused their cries for help to fall upon deaf ears. So many lives could have been saved if not for that, and other fateful events. This Orlando attraction takes you into the bridge where they turned the massive wheel to try to steer clear of the iceberg. Being taken past the Grand Staircase will take your breath away. A memorable artifact to behold is a full bottle of champagne with the cork still in place. This was taken from the wreckage along with other items pertaining to the surroundings. An iceberg, claiming to be the exact temperature of the air that night, is on display at this Orlando attraction; allowing people to feel how cold it was. The water temperature was far colder, no doubt. Some claim to not be able to touch the ice for more than ten seconds much less for hours. When visiting all the fun Orlando attractions, Titanic: The Experience, should be visited. To be taken back in time on that enormous ship is memorable, in deed. This Orlando attraction is a sports and entertainment venue. It is part of the Downtown Orlando Master plan 3 and located in downtown Orlando. The Master Plan 3 also includes improvements to the performing arts center and the Citrus Bowl. Opening on October 1, 2010, it had been discussed ten years prior to approval in 2006. The newly technologically designed sports and entertainment venue became a consideration after its predecessor, the Amway Arena was built in haste in 1989. While quickly constructed, new technology quickly made it become the oldest arena in basketball leagues. Amway billionaire presented the new Orlando attraction design to Orlando mayor who later approved its construction, design, and costs; which recently declared creditors could seek bankruptcy relief in a few years in way of repossession if relief was not made soon, which also states would not disrupt any “Magic’s” venue rights. With all history aside, what are some experiences to expect while visiting this fabulously new Orlando attraction? It is home to all the Orlando Magic games for the NBA, the Orlando Solar Bears of the ECHL, and the Orlando Predators of the AFL. As of November 12, 2012, the Amway Center was granted access to host second and third round games of the NCAA Division/Men’s Basketball Tournament in 2014. New announcement on January 14, 2013 include the Board of Directors voting to award Arena Bowl XXVI to Orlando in the summer of 2013, per a Wikipedia site. Games are not the only thing bringing people to this Orlando attraction. Concerts of all music variations are held in this arena also. RUSH, Taylor Swift, Paul McCartney, and KISS are some of the recent upcoming concerts to be held in this spectacular arena. Conducting a search online for your favorite artist will tell you if you can look forward to seeing them at the Amway Center soon, or even later. ORLANDO TOURIST TIP: When purchasing concert tickets, be sure to check out the seating maps/charts. Most concerts base their ticket price on the best seats. Sometimes, the upper levels just to the edge of the stage are less expensive, yet your view is still pretty good. However, if it is one of your all-time favorite artists, spring for the best seats in the house and have a memory of a lifetime at a concert in a great venue. What makes this Orlando attraction sports and entertainment center different from so many others is what indemnities it offers its visitors. Aside from it being over 500,000 square feet larger than its predecessor; therefore, allowing more spectators to view games and concerts, it also provides several different restaurants and bars throughout the arena. One restaurant, Jernigan’s, is an exclusive Club level restaurant. Reservations need to be made and are limited to ticketed guests only. Being able to eat exquisite food while having an astounding view which overlooks the arena bowl during Orlando Magic games is to die for. Dining is also available before many other events and concerts. Other restaurants and bars are located throughout. ATM’s, phone charging docks, and a child play area are also located inside. This Orlando attraction is the fantasy of other venues of its kind. 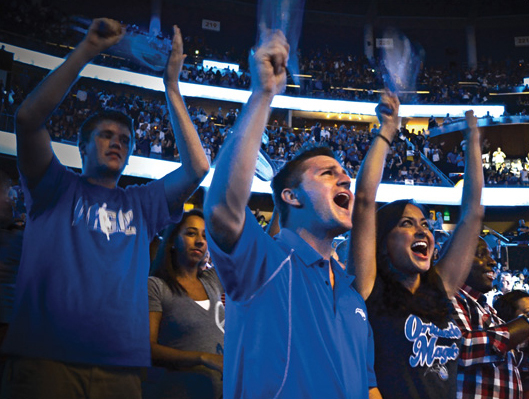 The Amway Center has paved the way to experience games, concerts, and events, while offering technological conveniences everyone wishes they had at one time or another, for other places to follow.